Biotic processes, such as predation and parasitism events, are crucial for answering questions in ecology and evolution. Here, we report predation and ectoparasitism events of invertebrates upon tadpoles in aquatic habitats of southern Brazil. Four lentic water bodies were sampled twice a month (December 2012 to March 2013). Those water bodies were located in the Diamante do Norte, County, state of Paraná, southern Brazil. The tadpoles, Dendropsophus minutus, Hypsiboas raniceps, Scinax fuscovarius, Physalaemus cuvieri and Elachistocleis bicolor were observed being predated by six different invertebrate predators. However, Leptodactylus fuscus and Pseudis sp. were also recorded on the same water bodies and were not observed being preyed or parasitized. The most abundant predator in our sampling areas was the diving beetle larvae. We observed a static and escape behavior of tadpoles when in close proximity to predators and constant movements in E. bicolor tadpoles, which can be advantageous for invertebrate predators. Parasitism events included D. minutus, S. fuscovarius, and E. bicolor tadpoles that were infected by a single leech. The ectoparasites anchor the posterior sucker on the host tadpole during the blood feeding. Even isolated reports of ecological interactions are important for understanding ecological communities and the impacts of parasites and predators on tadpoles' populations. Additionally, these interactions can help to understand the ecology behavior of the organisms. The knowledge of relationships between organisms is crucial for answering many questions in ecology and evolution (McDiarmid and Altig ; Berven and Boltz ; Hammond et al. ). Thus, the comprehension of biotic processes, such as predation and parasitism, is important for understanding factors that can act on the structure and distribution of ecological communities according to their habitats (Van Veen et al. ; Borges-Júnior and Rocha ). Predation is considered to be one of the main factors that control the size of natural populations, especially in the Neotropical region, because it can regulate species richness and abundance (Morin ; Borges-Júnior and Rocha ). In addition, parasites can directly affect their host's fitness, causing a non-lethal effect that changes individual behavior (Berven and Boltz ; Begon et al. ). 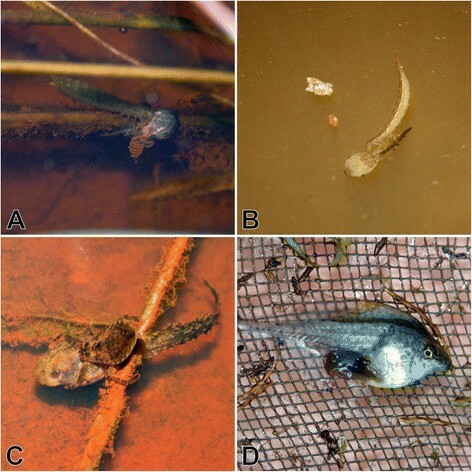 In this paper, we report predation and ectoparasitism events of invertebrates upon tadpoles in aquatic habitats located in the agricultural landscape of southern Brazil. In this study, we sampled four lentic water bodies located in the Diamante do Norte county (22° 36′ 41.29″ S 52° 53′ 51.63″ W), Paraná State, in southern Brazil. We sampled three permanent water bodies and one temporary water body, both of which were 1 m deep and covered an area of approximately 150 m2. These water bodies were located in an open, anthropogenic area surrounded by sugarcane crops. Fieldwork was conducted monthly during the breeding season between December 2012 and March 2013. This time period was selected for ecological reasons because the breeding season of most anurans in the Neotropical region is restricted to the rainy season (October to March), with the peaks of anurans abundance on December to March months. We sampled each pond twice a month for an hour twice a day (i.e., afternoon and night), which resulted in a total of 32 h of sampling effort. During the afternoon periods (13:00 until 17:00 h), an observer performed predation and/or parasitism observations in each pond by sampling tadpoles with a dip net wire mesh (3 mm2) in the riparian zone for 1 h. During the night periods (18:00 until 00:00 h), an observer performed predation and/or parasitism observations in each pond by walking around the breeding site for 1 h.
During the afternoon and night periods, we collected tadpoles that were dead and/or injured during predation and/or parasitism events. The tadpoles were anesthetized in a menthol solution and preserved in 10% formalin according to Heyer et al. (). We identified all tadpoles that were preyed upon or parasitized upon using a Zeiss stereomicroscope (Zeiss, Oberkochen, Germany) following the taxonomic key proposed by Rossa-Feres and Nomura (). Voucher specimens were housed at the Zoological Collection of the Universidade Federal de Goiás (ZUFG). Predators and parasites were also collected when possible and were preserved in 98% alcohol and identified following Benetti et al. () and Mugnai et al. (). We registered 14 predation events between larval anuran species and six invertebrate predators (class Insecta). Predation events were observed for Dendropsophus minutus, Hypsiboas raniceps, Scinax fuscovarius, Physalaemus cuvieri, and Elachistocleis bicolor (Table 1). Leptodactylus fuscus and Pseudis sp. were recorded in the area but were not observed being predated or parasitized upon. n = number of events observed. Tadpoles were observed being preyed upon during both time periods (afternoon and night) by beetles and dragonfly larvae at the edge and at the middle of the ponds at a depth of approximately 45 cm. Tadpoles were held strongly in the jaws of the diving beetle larvae and in the labial palps of the dragonfly larvae. The predation events were initiated at the prey's head. Diving beetle larvae performed circular movements in the water column while hunting, whereas dragonfly larvae waited motionless during the entire predation events. Adult water bugs were only registered preying upon tadpoles at the edge of the ponds in a depth of approximately 20 cm during the night period. Water bugs held tadpoles by their head. In one of three observed cases, the water bug left its prey and dove deeper into the water because it was disturbed by our presence. The prey remained static during predation events, probably due to their weakness. All of the tadpoles we collected from the predation events we observed were dead. We observed two categories of tadpole behavior when they were close to their predators: a static and an escape behavior. The static behavior is a defense mechanism used against visual aquatic predators. Many anuran tadpole species, such as Physalaemus marmoratus (Nomura et al. 2003), Rana sylvatica, and Rana clamitans (Fraker ), can decrease their activity levels in response to predators. The escape behavior is a defense mechanism whereby the predators perform some sudden movement in the aquatic environment. The possibility of escaping allows the tadpoles to reach a safe refuge, which can be enhanced by increased swimming abilities (Teplitsky et al. ). Individuals can present both categories as predator avoidance mechanisms. According to Nomura et al. (), tadpoles also present antipredator mechanisms that reduce their predator's capture success. Antipredator tactics, such as cryptic behavior and unpalatability, which do not involve modifying activity, can also occur in tadpoles. Cryptic behavior occurs when tadpoles modulate their activity according to the substrate coloration (e.g., P. nattereri). Unpalatability allows tadpoles to maintain their activity due to the presence of toxins in their skin (e.g., Rhinella schneideri tadpoles) (Nomura et al. ). Macan () reported that dysticids are commonly recorded in environments that do not have fishes, such as our study sites. However, several studies show that the main predator of tadpoles in environments that do not have fishes are dragonflies (e.g., Gascon ; Gonzalez et al. ). According to Hero et al. (), tadpoles coexist with different predators. However, the different abundances of those predators in the ponds could change the effectiveness of each predator (Jara and Perotti ). Additionally, preys adjust their activity levels due to their predation risk. This way, intrinsic factors such as biorhythms could moderate the activity of tadpoles in response to the presence of predators (Fraker ). Thus, we emphasize the need for studies to be conducted on different types of predators so that a better understanding of the relationship of invertebrate predators and tadpole assemblages can be obtained. E. bicolor tadpoles constantly moved between the bottom and the surface of the ponds, emerging repeatedly from the surface. This may be due to their nutrition (they are suspension feeders), but similar movements could also be observed in S. fuscovarius at night. Constant movements in prey can be advantageous for invertebrate predators that demonstrate a sit-and-wait foraging strategy and have been identified in R. schneideri and Itapotihyla langsdorffii tadpoles (Nomura et al. ; Luiz et al. ). However, new empirical and experimental studies are needed to assess whether E. bicolor is actually the most preyed upon tadpole species because of their constant movements. We recorded four parasitism events between two species of invertebrates and tadpoles. Parasitism events included D. minutus, S. fuscovarius, and E. bicolor tadpoles (Table 1). All tadpoles were infected by a single leech (Figure 1). In all of the parasitism events we observed, tadpoles were alive when we collected them. Predation and parasitism events on tadpoles reported in Diamante do Norte, Paraná State, Brazil. (A and B) Dragonfly and dysticid larvae preying upon Elachistocleis bicolor tadpoles, (C) water bug preying upon a Hypsiboas raniceps tadpole, and (D) leech parasitizing upon a Dendropsophus aff. minutus tadpole. The behavior of other tadpoles around leeches seems to be aleatory. It is possible that they did not notice the presence of ectoparasites in the pond. Parasitized tadpoles moved normally around the pond. The ectoparasites anchored the posterior sucker on the host tadpole during the blood feeding. The anterior suckers of the leeches are used to tear the skin from the tadpole hosts. Barta and Sawyer () described similar behaviors in Placobdella picta leeches feeding upon tadpoles; however, McCallum et al. () suggested that this behavior could be variable. Berven and Boltz () demonstrated that Rana sylvatica tadpoles were more likely to be infected by a single leech because most ectoparasites can kill tadpoles in the long-term. Thus, the interaction of leeches and tadpoles in our study area may be apathogenic, as was recorded for the endoparasite Trypanasoma diemyctyli in newts (Gill and Mock ). This is the first study showing predation and parasitism events on tadpoles by different families of invertebrates in Neotropical aquatic habitats in southern Brazil. Even simple ecological interactions, such as predation and parasitism, should be reported in more detail for tadpole assemblages because the data can help to inform future experimental designs. These interactions, even when described in isolated reports, are a starting point for understanding ecological communities and the impacts of parasites and predators on tadpole populations. Additionally, these isolated reports can help us to better understand the behavioral ecology of these organisms. We thank MGarey for the valuable suggestions on previous versions of the manuscript and RRV and AFC for the final English revision. The Caiuá Ecological Station and Nupélia provided logistical support during fieldwork. RPB, RMT, and FHO are grateful to CNPq for a fellowship. PGG, VGB, and RMC are grateful to CAPES for fellowships. Instituto Chico Mendes de Conservação da Biobiversidade (ICMBio/RAN) and Instituto Ambiental do Paraná (IAP) provided collecting permits (ICMBIO/RAN # 25916-1 and IAP # 278/10). PGG, VGB, FHO, and RMC participated in fieldwork and wrote the manuscript. RPB and RMT helped in the identification of tadpoles and parasites, respectively, and participated in the design of the manuscript. All authors approved the final manuscript.